How To Invest In Gold Through ETF: Investing in aGold Exchange TradedFund (ETF) can give you better returns thaninvesting in physical gold. The frequent crashes in the stock market have made people even more interested in gold. Now that even Fixed Deposits aren’t giving great returns, many have started diversifying their portfolio byinvesting in gold. Want to know how? Read on. Loading the player… DEFINITION of ‘Exchange-Traded Fund (ETF)’ An ETF, or exchange-traded fund, is a marketable security that tracks an index, a commodity, bonds, or a basket of assets like an index fund. Unlike mutual funds, an ETF trades like a common stock on a stock exchange. ETFs experience price changes throughout the day as they are bought and sold. ETFs typically have higher daily liquidity and lower fees than mutual fund shares, making them an attractive alternative for individual investors. 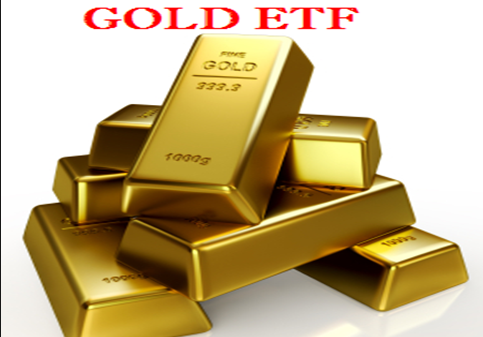 Gold ETF is an ETF that tracks physical gold prices. The first gold ETF in India was launched by benchmark Mutual Fund in 2007. One unit of gold ETF is usually equal to a gram of gold. These ETFs are backed by physical gold of the highest purity. Gold ETFs were launched in India only a decade back. Unlike a Mutual Fund, an ETF will be listed on stock exchanges and are traded like stocks. Using a gold ETF, you can easily invest in gold in small amounts at different price levels to ensure higher returns. Presently, there are 14 gold ETFs in India. While for some of them, one unit is equal to one gram of gold, for others, one unit is equal to half a gram of gold. For instance, if you invest in an ETF where 1 unit is equal to 1 gram of gold, the units will be allotted in such a way that the value of each unit you buy corresponds to one gram of gold. So, if you invest Rs. 27,000, when the price of 10 gram of gold is Rs. 30,000, you will be allotted nine units. You need to check the unit value before investing. Ideally, all gold ETFs where the unit of gold is the same should have the same NAV. However, NAVs do differ slightly. Why? This is because a gold ETF will not only buy gold it will also invest in some other assets like bonds and Government securities. Sometimes the ETF also holds cash in order to buy gold at lower prices. This is why the NAVs of different funds are different. Another point is the expenses incurred by the ETF. When the fund buys and sells gold on your behalf, they need to pay a number of charges such as brokerage fees, Value Added Tax (VAT), custodian charges, among others. Depending on the accounting policies of the Mutual Fund house, the NAV of the fund will be adjusted for these expenses on a daily basis. Note that you pay fund management charges for investing in the fund. This is the reason why the NAV of the funds differs. For example, the NAV of Birla Sun Life Gold ETF stands at Rs. 2,783 while that of IDBI gold ETF is Rs. 2,790. Note that, usually, these differences in NAV are minimal if the funds have the same unit value. So, there won’t actually be much difference in the returns generated by them. Gold ETFs are funds that are managed passively and their returns will closely follow that of physical gold in the market. For redeeming your units, you can approach either the Mutual Fund house or the stock exchange. Note that the Net Asset Value (NAV) of each of these funds will be different. Now, why is that? There are certain factors that you need to look at before you start investing in gold ETFs. Here’s the list. Expenses: All Mutual Funds incur expenses and these expenses reduce your returns. So, the lower the expenses, the better it is. How do you know which fund incurs low expenses? Check its expense ratio. The lower the expense ratio, the better will be your returns. Tracking Error: As you know now, gold ETFs track physical gold and for this, they use a benchmark. However, there usually is a slight difference between the returns that the benchmark generates and the fund’s returns. This is known as tracking error. The lower this error, the better because you want your fund to replicate gold prices as closely as possible. So, ideally, you should be going for funds with lower tracking error. Liquidity: You should be able to sell your ETF when you need money and quickly, right? Since gold ETFs are traded in stock exchanges, you need to understand how liquid they are. The higher the trading volume for the gold ETF, the more liquid they are. The more liquid the ETF, the easier it is for you to sell it. In order to invest in gold ETFs, you will need a demat account. If you already have an online trading account with any broker, you can buy gold ETFs yourself or by giving instructions to your broker. Open a demat account with a depository participant like National Securities Depositories Limited (NSDL) or Central Depository Services Limited (CDSL). Open an online trading account with your broker. Allocate money for the purchase. Choose the ETF that you want to invest it. Check its availability and price on the stock exchange. Place the buy order using the trading account or through your broker. Most Mutual Funds have a minimum investment criterion. Check before you invest. The units will be credited to your demat account. You can check the units credited and the amount at which they were purchased. You can redeem them anytime using your online trading account. Related Posts of "How To Invest In Gold Through ETF (Exchange-Traded Fund )"